Welcome to the series of articles "How To Build A Photo Booth" written by the staff at Photo Booth Experts. These articles were not written in order to sell our products but rather they were written to give ideas and useful information to those looking to become more informed of certain details when building a photo booth yourself. PLEASE NOTE! What you about to read is only our opinion (based on our own experience) of what we feel is the best approach towards building and designing a photo booth for party rentals. Remember that the choice of structure design, components and software is ultimately up to you. PLEASE NOTE: This article was originally posted on 9/23/2012. Since its posting, there have been many updates and changes in technology. Rather than create a whole new article, we have updated the original article with this current information. Throughout this article you will see our updates along with the dates this information was written. After you made the decision to start your own Photo Booth Business and build your own Photo Booth you are going to face a series of decisions regarding Photo Booth components. Our article " How to build your own photobooth - Part 1 Photo Booth Computer." will guide you through the choices and hopefully will help you decide about how to choose the computer for the photobooth. The second most asked question What camera is the best for the photo booth? 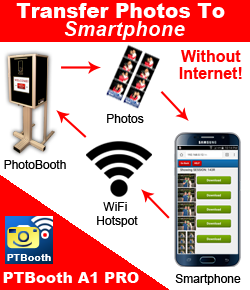 The Camera is one of the most important device in the photobooth that will define your photo booth business. It is truly groundbreaking component that will have the impact on other photo booth components. Before we begin here is the questions that you have to ask yourself when choosing the camera for the photo booth. First question that will define your camera choice. It has been a long debate what type of camera exactly to choose: DSLR or Point and Shoot or Webcam. This choice also correlates with other important question "What Photo Booth Software to use?" because the software that you may like or want will or will not support a certain camera types. DSLR - delivers outstanding image quality simply because these cameras are designed for it. DSLRs delivers anywhere from 12 to 22 megapixels image because DSLR camera typically has a much bigger sensor than a point and shoot camera . Point and Shoot - Excellent image quality (5 to 12 megapixels). Webcam - Acceptable image quality with the right settings. (up to 14 megapixels). Now just to be clear the webcam is no match to Point and Shoot or DSLR cameras because it designed for completely different purpose, to shoot video, do not expect high quality images when using the webcam. How much image quality do you need? The Photo Booth purpose is to take a series of photos and print the picture (photostrip or other layout). The goal is to deliver a picture where all people are clearly visible, well lit up, without any blur. Usually the size of the printed picture is 4x6 inches. On that 4x6 inches you will have a 4-3 pictures lined up which brings the size of each individual picture to about 0.7-1 inch big. For that kind of size you need no more than 1-3 megapixels. Now, it is a different story for saved pictures that you will provide to your customers. In that case as more megapixels as better because the extra quality will only benefit you allowing to print much larger individual pictures. But image quality is not just about megapixels. It also about the camera sensor size, lenses, lighting and picture scenery. Webcam for photobooth - although it can be up to 12 megapixels due to image sensor size and the lens type it will never deliver the quality that any photo camera will. Some Photo Booth companies or DIY photo booth users do use Webcam in their photobooths. The only advantage of the Webcam - the price and small form factor. PROS: SMALL FOM FACTOR, CHEAP PRICE, EASY TO HANDLE. It is very easy to mount the Webcam practically in any type of photobooth enclosure. If you going to choose Webcam for your Photo Booth business you will have a very tough time competing with the other Photo Booth companies who use photo camera simply because you will never be able to deliver equal or better image quality. The customers will never take you seriously when they find out that your photobooth using the Webcam. Put yourself in the customers shoe: Which photo booth for your event would you choose if you have a choice between photobooth with normal photo camera and photobooth with the webcam? The choice is yours but we would not recommend using the Webcam for taking pictures. If you are building the Video Booth the Webcamera is the best choice for video recording. After years of testing different webcameras we have concluded that the best cameras for Video recording are the Webcameras with native hardware based built-in H.264 compression. The built-in H.264 compression means that your computer will use significantly less power during video recording and handling the video files. DSLR camera for photobooth - you would think that it is a hands down BIG YES to use DSLR camera for the photo booth especially after reading the beginning of this article " delivers outstanding image quality ", "12-22 megapixels" or reading other articles of "How to build your photobooth" on the internet - oh yeah that is the winner! NOT SO FAST! In our opinion when building the photo booth you have to apply a great deal of reasoning and practicality along with the knowledge and facts. Let's break down the DSLR camera choice for the photo booth. First of all the image quality. Outstanding, excellent, amazing these words are all about the DSLR image quality. It is true and it is the fact that will require no objection. HOWEVER that image quality require great deal of knowledge. You will argue "well, i wil set the settings on Auto and i'm good to go" - it will serve you well if you are taking pictures at home or at the nature settings but here we are discussing PHOTO BOOTH. When we were building the photobooth we had a chance to try a different cameras, in fact all of them (DSLR, point and shoot, webcam) and here is what we discovered when we used DSLR camera in our photo booth. DSLRs large depth of field. With DSLR cameras, you can get a very shallow depth of field and completely isolate your foreground from the background. It is the quality that any photographer desire very much because the pictures with the shallow depth of field are absolutely beautiful. However in the photo booth setting that very same otherwise desired shallow depth of field actually hurting. Obviously it is all depends on the type of your photobooth and the factors such as: what is the size of your photobooth, is it sit down photobooth that fit 1-2 persons, is it stand up photo booth that fit up to 12 people, is it a kiosk type photobooth that does not have any enclosure, what color of the backdrop are you using, and other factors. In our case we have built a photobooth that is 5 feet wide 8 feet long and can fit up to 12 people. When using DSLR camera we got a problem with depth of field and focus. If there was more than 2 people in the photobooth and the distance between the camera lens to each person was different the only one person was in perfect focus, the other people depending on their distance from the camera lens was from partially in focus to blurry. After consulting with the photographers we have been told that we can reduce the depth of field by correcting the settings combination such as aperture and the shutter speed. We spent hours trying to get the acceptable results and partially succeeded but it was only for the particular scene, once the # of people in the photobooth changed of even the color of the close they wear and any other objects such as props the settings needed to be readjusted. The "Auto settings" mode did not delivered the desired results either. We decided to abandon the idea of using DSLR in our photobooth for that and other reasons as well. Again it is only our opinion based sole on our experience. Is it possible to use DSLR in the photo booth? The answer is YES. You just have to determine the Pros and Cons when planning to use DSLR camera for the photo booth. Other reasons NOT TO USE DSLR camera for photobooth. You have to know which lens will deliver best performance of DSLR camera in photobooth environments. And it could be not the type of lens that came with the camera, which translate to additional expenses. Power adapter is more complex and expensive than point and shoot camera power adapter. When we talking about image quality the DSLR will deliver the best image quality. But all these megapixels translate to bigger individual file size. In fact the image files so big that handling the images requires more computer power. Which is not big deal if you can spare more money to get more powerful computer. But as we discuss this earlier in the photobooth you really don't need all these megapixels. Again the choice is yours. We will not say that WE DO NOT RECOMMEND THE DSLR CAMERA FOR THE PHOTOBOOTH but we will not say that WE DO RECOMMEND THE DSLR CAMERA FOR THE PHOTO BOOTH either. We can only say that WE ARE NOT USING THE DSLR CAMERA IN OUR PHOTO BOOTH for the reasons we described above. And we hope this article will show you different prospective when it comes to choosing DSLR as your photobooth camera. Point and Shoot camera for photobooth - the camera that combines all necessary features and options that required in the photo booth. So let's get right to it. Before we begin talking about the PROS we would like to address the CONS first. Unfortunately all photobooth software has limited support for point and shoot cameras. There is a reason for it but we not going to discuss that because it's not an article about the photo booth software. So the choice of Point and Shoot cameras has a limit. Mostly these cameras can be found on second hand market, online at Ebay, Amazon, Craiglist etc. The huge downside is that you will only be able to buy a USED camera and you will be lucky if you can get your hands on manufacturer refurbished camera. However, the affordable price makes it somewhat reasonable choice. For example: the price for photobooth software supported point and shoot cameras is around $150-$350 depends on the camera. Even with the risk of buying not so perfect condition camera it is still affordable choice. Speaking of hidden agenda :) we offer point and shoot cameras in the package with our photo booth software PTBooth. All our cameras are used but in perfect to excellent condition. Each camera undergoes a thorough testing at our live photobooth rental events and backed with our 1 year limited warranty. Now let's hear the reasons WHY POINT AND SHOOT CAMERAS are perfect for the photo booth. AFFORDABLE - priced around $150-$350 for the price of 1 DSLR you can get 2-3 PS cameras which makes possible to have a backup camera even on the tight budget. IMAGE QUALITY - point and shoot gets your entire scene nicely in focus making the entire scene look sharp. All people in your photostrip will be always in focus! Megapixels wise most of the supported PS cameras delivers 8-12 megapixels that way more than enough for the photobooth applications. ABILITY TO USE EXTERNAL FLASH - most popular photobooth point and shoot cameras has hotshoe for external flash usage. It is critical to be able to use Flash because it will eliminate blur caused by movement. AFFORDABLE ACCESSORIES - most PS cameras use AA batteries which automatically makes is affordable to replacement, the power adapter is also cheap ($10-$20) compare to DSLRs power adapters. SIMPLE, EASY TO USE - in case of PS camera you don't have to know the photography in order to make it work. Setting the camera on AUTO will do the work for you. That SIMPLE! No stress, No worries. SMALL FORM FACTOR - compared to DSLR it is very compact. Makes it much easier to handle especially during the transportation. Again the choice is yours. WE USE CANON POWERSHOT S5 IS IN OUR PHOTO BOOTH. to use for any photo booth design. The photo booth camera brand choice is completely depends on what photo booth software you are planning to use. Make sure you check supported cameras list of the photobooth software of your choice to be certain that your camera is supported. Usually it comes down to either CANON or NIKON cameras. Almost all cameras are earned the great durability ratings. Obviously it depends a lot on how do you care about your camera. We have our Canon PowerShot S5IS cameras in all our photo booths for more than 4 years. We carry them in the soft camera bag with padded inserts. We have no problems at all. Camera Accessories that will help you to use it in the photobooth. Most important accessories that you going to need when building the photo booth are: Camera power adapter, for continues power for your camera. External flash, with an external flash you will be able to avoid blur when people are moving during the photo session. We hope this article will help you to make sound decisions when it comes to buying and using camera for your Photo Booth. This article has been written by the staff at Photo Booth Experts. PTBooth is property of Promotions Technologies Inc.. All rights reserved.